I decided to start the assignment off with a landscape shot which was quite distant from what were essentially the two subjects. I chose the quite distant viewpoint so I could firstly fit in both main subjects of the photograph but also to introduce the series of photographs from a wider perspective. 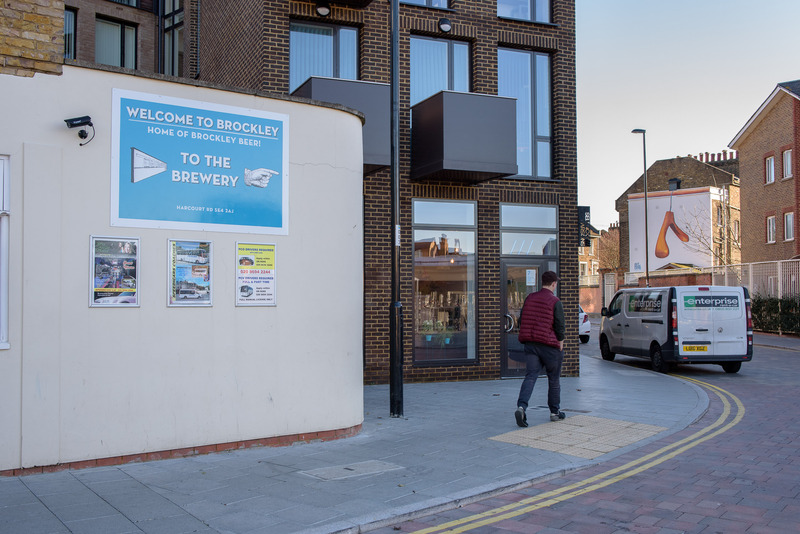 These subjects comprised of a man walking off round a corner juxtaposed with a stand-out sign welcoming the viewer to the neighbourhood and specifically the brewery. Although this relationship was quite unimposing, I felt it worked because it could be imagined the man was perhaps walking off to the brewery itself (the sign did have a pointer in that direction after all). I have added context to the photograph with the title: ‘To the Brewery’, which reads the same as the sign on the wall. I would say this gets across to the viewer concretely the essence of the photograph but is somewhat unnecessary on this occasion. This is because the sign is so apparent and is supplemented by the person walking in that direction. f/6.3, 1/200s, ISO 320, focal length 35mm, handheld.